To be honest, I didn’t know what to expect from El Salvador. It has recently stolen Honduras its infamous title of being the world’s most deadly country. Not that we choose countries based on what media tell the world (most recent example being Venezuela), but we don’t ignore the news either. Just to have some idea what is going on in the country we are going to visit. Probably for this very same reason, not many people visit El Salvador. 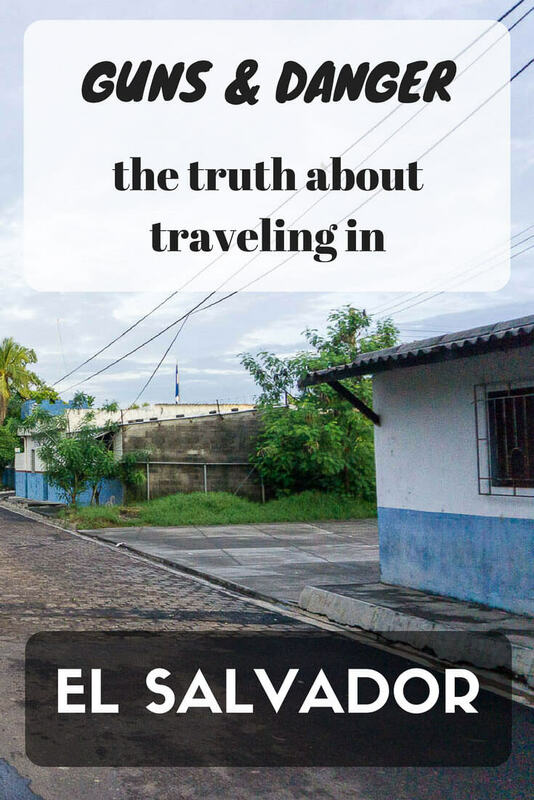 A lot of travellers in Central America skip it entirely and travel straight from Guatemala to Nicaragua. We decided to spend some time in El Salvador and see ourselves. They have an official tourism board like any other country so tourists do still visit. Aside from gangs ruining country’s reputation, there are still good people living their normal lives. We decided to go to the only place where a tourist agency offered to take us from Guatemala – beach El Tunco. This place is flooded with backpackers but it is the only place most of them visit. It is also probably the safest place in El Salvador. 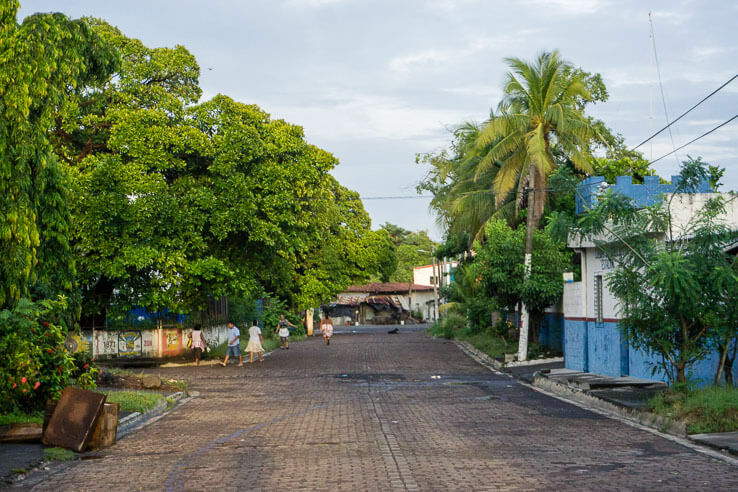 El Tunco has one main street if you can call the sandy stretch a street. There are hostels, bars, restaurants, surf shops and souvenir shops. Tourist police is in the middle of “town” and armed police officers guard the beach on every corner. 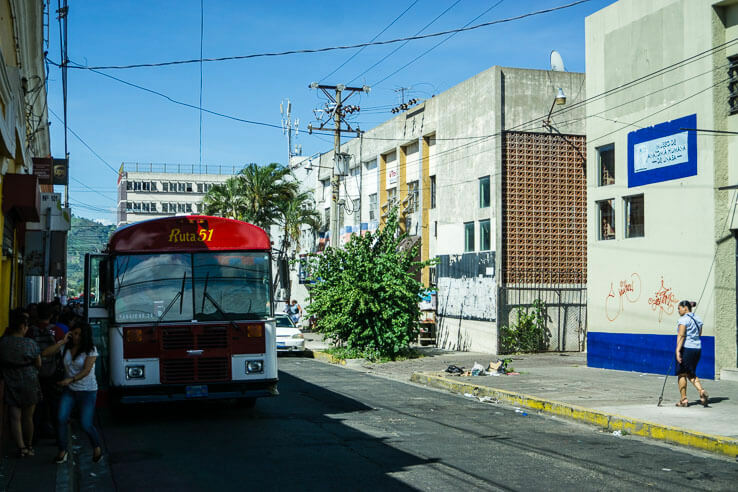 It seems that during the weekends, when young people for the nearby capital San Salvador visit El Tunco for party time, the number of police officers doubles. 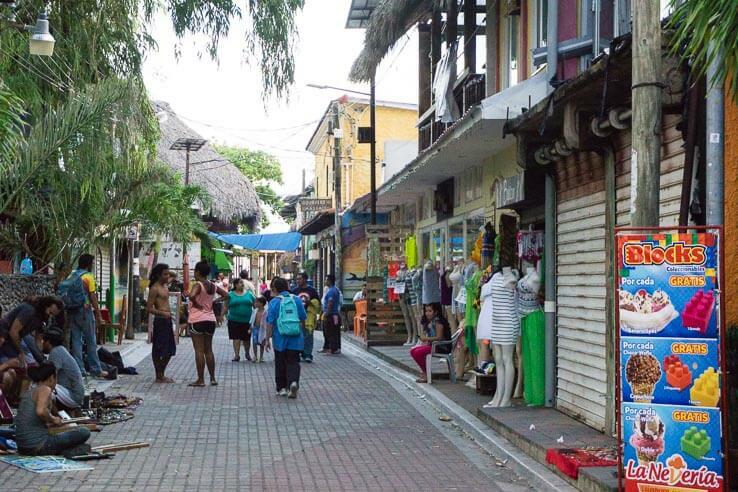 Safety of tourists is taken very seriously in El Tunco. There are few access roads through which you can access El Tunco and all of them are guarded with barrier and security guards. It felt like being in an all inclusive hotel resort where they tell you to better stay inside the resort and not go out. The beach in October was filled with huge rocks, therefore not ideal for a beach run or beginner surfing. We went out of the secured area of El Tunco for a morning run. Not only we’ve met smiling ladies offering us fruits and fresh coconut water, we were surprised how considerate drivers are. We were running along the road, as we didn’t see any other trail, and never felt in danger. After a few days of hanging out by the pool, it was time to move on. Other than partying and surfing, there is nothing to do in El Tunco. 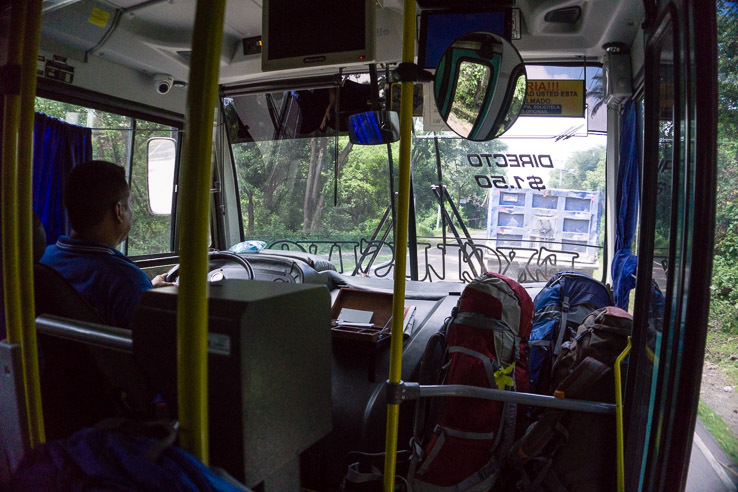 Our bus from El Tunco to San Salvador had an AC, security cameras and costs 1,50USD per person for 40 km journey. When we had to find another terminal for our bus to Santa Ana, we had to ask for directions a few times. Every person greeted us with a smile and once we asked for directions, they were curious where we come from. Bus to Santa Ana was even more luxurious – apart from AC and security cameras, it had reclining chairs and TV (1,35USD for 70 km trip). We managed to miss our stop in Santa Ana. We got off the bus and tried to navigate our map on phone. A girl came to us with google translator asking if we need help – it was translated from Spanish to German. We understood the Spanish sentence so we communicated in our broken Spanish and she gave us directions. Our backpacks felt heavy and we were dying from sweat in the heat. We took a break at a gas station to buy some water. A man finished withdrawing money from ATM and asked us if we were headed to hostel Casa Verde. Well, yeah..how did he know? He offered us a ride. A bit reluctantly we accepted, happy not to walk another 2 km under the midday sun. He dropped us off and declined any money we were offering him for the ride. Generosity at its best! Santa Ana is the second largest city in El Salvador, after capital San Salvador. Its main square is lined with historic buildings, a church and a few restaurants. A big market full of clothes and fruits and vegetables is nearby. 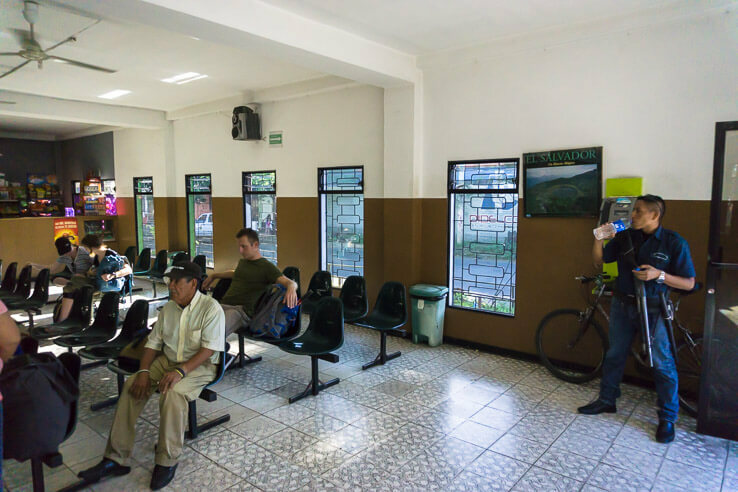 We stayed at the best hostel in El Salvador voted by Tripadvisor reviewers – hostel Casa Verde. In our opinion, it is the best hostel in Central America. Quiet oasis with a pool, rooftop terrace, hammocks and luxurious dorms and private rooms. 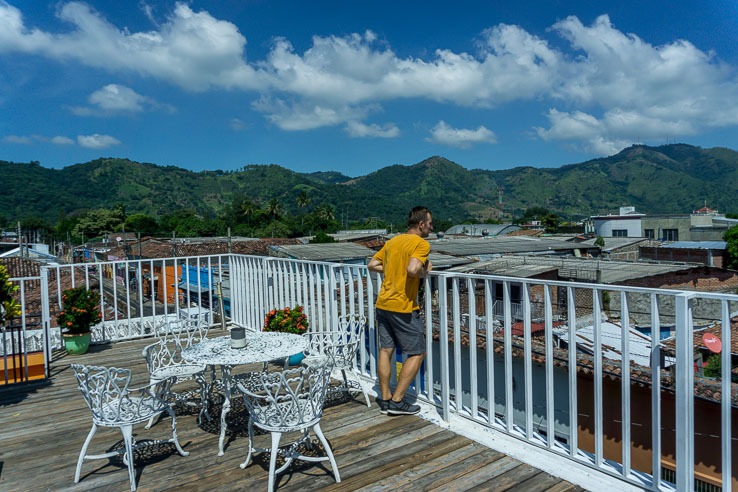 Owner Carlos rebuilt the house where he was born into a hostel. He takes a great care of guests offering many tours around the city and free bikes. We rode them to a sports complex for our evening run. The area of football field, playgrounds and swimming pool was full of runners and people playing football and basketball. Just Salvadorians and the two of us. The whole area was guarded by men with rifles and we were told to come back to the hostel before dusk. Nothing new at this point for us, armed security guards with rifles half the size of their body stand in front of every grocery store, bank, bus station or a store carrying bigger amount of cash. We even hiked an active volcano Santa Ana with a mandatory police officer – just as a precaution. We’ve never felt unsafe during 4 days we spent in Santa Ana. Last day, Carlos arranged a ride for us to the bus stop. 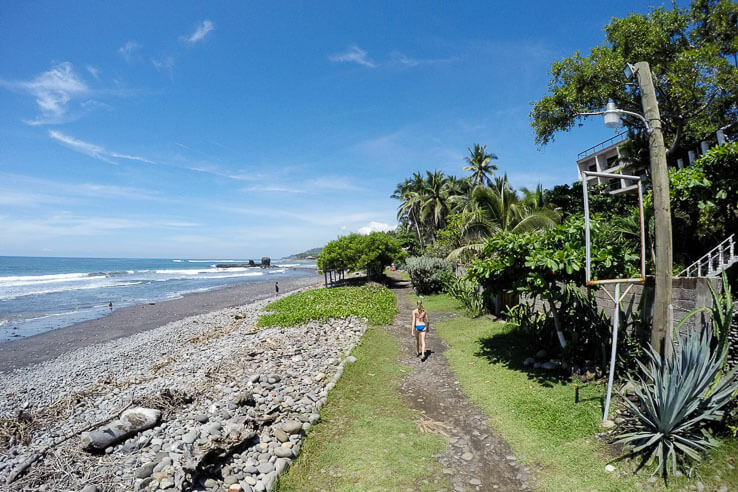 We were headed to the other side of El Salvador – seaport La Union. The bus ride from El Salvador to Nicaragua takes 10 hours (including border crossing in and out of Honduras), boat ride should take 1,5h. Our goal was to find a boat to take us across Gulf of Fonseca to Nicaragua. Plus, we would be crossing former pirate waters. The whole afternoon and evening in La Union were spent walking along the shore and asking people about the possibility of a boat ride to Nicaragua the next day. Nobody could give as any solid information. Some said there is no boat on Saturday; some said maybe there will be a boat on Monday. Did we manage to cross the Gulf of Fonseca and enter Nicaragua? Read our next week’s post to find out. 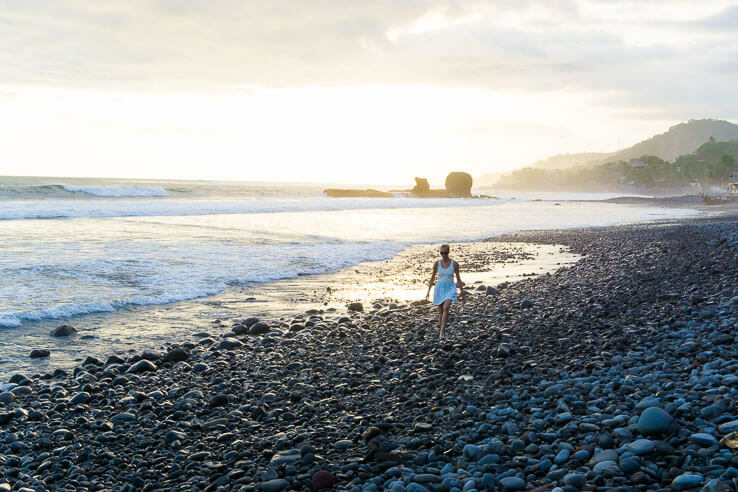 Should you visit El Salvador? Absolutely, it’s a beautiful country full of kind and friendly people. When you visit, you will get used to seeing guns everywhere, but the actual danger is non-existent in the places we’ve visited. Disclosure: Some of the links in this post are “affiliate links.” This means if you click on the link and make a purchase, we will receive an affiliate commission, at no extra cost to you. We only recommend products and services we personally use and believe they will add value to our readers. The word danger is overused a lot. But I’ve only spoken about places we’ve visited. Glad to read your post about El Salvador (I saw it on Mapping Monday). Good to read you had a good time there and better to know you wrote your honest opinion about the county (which ended up being good). I initially visited El Salvador on a missionary trip and then married a Salvadoran. So, I have been many times in the country and I only have good things to say about it. Glad others have the good will to visit (and support the local economy). Thanks for reading Ruth. 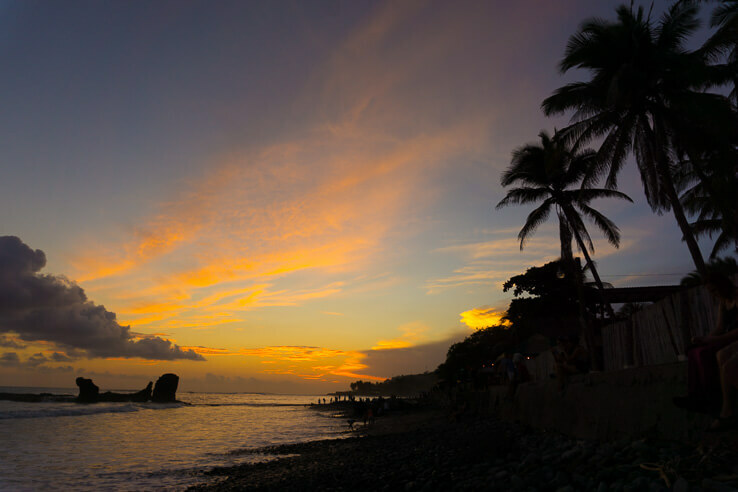 I hope other travelers will also read your comment so it will encourage them to visit El Salvador even more. 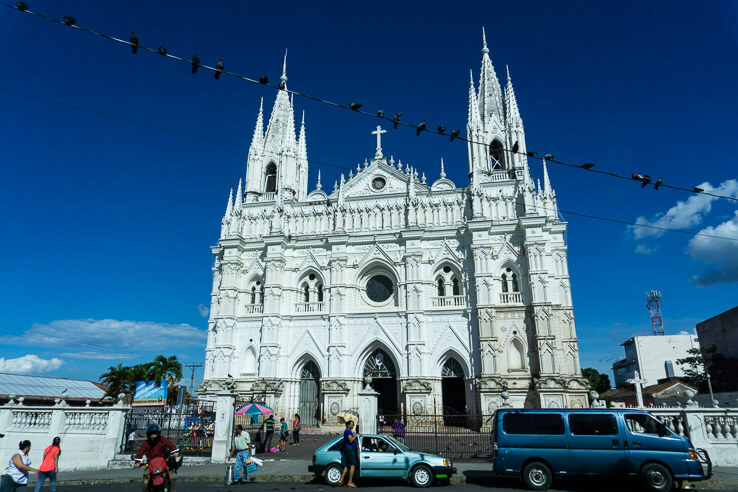 El Salvador is not on our radar, but it was interesting to read your post. I recently wrote about Travel Advisories and how they impact our decisions to travel. I’ve pinned your pin to my Blogger Tales board. You too are brave, but you were rewarded with what looks like much beauty. El Salvador is very beautiful. An interesting trip, surely this will be a beautiful, wonderful memories. Absolutely one of the best trips I have been on would go back in a minute and enjoyed being both on and off the resort. The people were more friendly than Canadians and just like anywhere there seemed to be good areas and not so good areas. Overall, one of the most beautiful places on earth. I would go there over Mexico or the Dominican in a heartbeat!! Good to hear. El Salvador needs more visitors for sure!